As the Star Wars Trilogy's box office success approached its apex with Return of the Jedi, so did the scope of its merchandising cross-promotions. By 1983, the direct connection between the Star Wars cinematic experience and young viewers' tastes as consumers had never been stronger or more deliberate. The franchise's commercialism was manifested at full force when it came to food and beverage tie-ins, and particularly those geared toward the primary target audience of kids. And Vitamin C is important when you're a kid. At least, that's what my mom always said. It must have stuck, as I still drink a glass of orange juice every morning with breakfast and I never seem to catch a cold. Anyway, Hi-C's Return of the Jedi promotional slate was fairly extensive, as highlighted in this great article on StarWars.com. 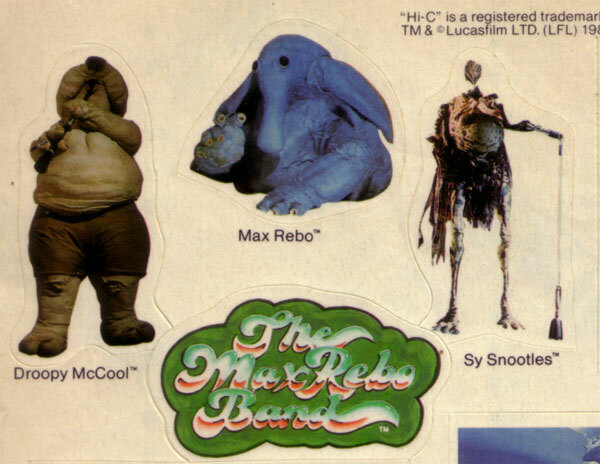 Included were a poster with beautifully unique artwork, a sticker sheet with a rad logo for the Max Rebo Band, and finally, an exclusive t-shirt and hat offer. The above print ad appeared in the Sunday comics section on May 29th, 1983 and represents, in my mind, the quintessential depiction of 1980s Star Wars synergy: the movie theater, the poster, and two kids donning the merch with sugary beverages in hand. Interestingly, the cartoon-style artwork of the young theater patrons somewhat replicates a photographic image that was printed on the Hi-C can labels, though the children in the photo aren't looking quite as enthusiastic – most likely because they are wondering where the hell their complimentary Hi-C is at. In addition to three quality seals from any flavor of Hi-C, customers needed to mail in $3.99 for a t-shirt or $3.25 for a hat. Or for a generous 25¢ discount, you could get the full outfit for $6.99. All in all, not a bad deal for some Jedi swag that also appeared to feature distinctive artwork. One would be pretty well equipped for an afternoon at the movies with this pair of Jedi garments. Jasper J. Nixon surely has them in his wardrobe, or the back of his Datsun.